Strongly interacting galaxies are experiencing a short-lived but important stage of galactic evolution, characterized by tidal tails, bridges, and other morphological peculiarities. Enhanced star formation and luminous young star clusters are also present in some cases. 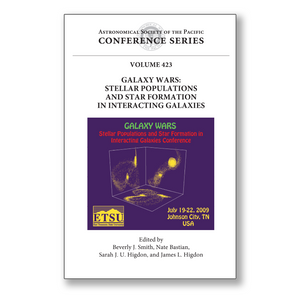 In this conference proceedings volume, the physics of galaxy interactions is highlighted in relation to the stage of evolution, morphological structure, interstellar matter, and stellar populations. This meeting brought together people who work on different aspects of interacting galaxy research, from star formation experts, to population synthesis aficionados, to numerical modelers, to experts in observations at different wavelengths. The goal of this meeting was to work toward a more complete physical picture of these encounters. This meeting focused on the following topics: 1) star formation thresholds and triggering mechanisms, 2) age-dating of stellar populations, 3) star cluster formation and destruction in interacting galaxies, 4) the nature and role of induced spiral and ring waves, and 5) detailed matching of numerical models to observations of specific systems. The presentations at this meeting involved three kinds of studies: statistical studies on large samples, such as the Sloan Digitized Sky Survey, detailed studies of individual nearby systems with NASA satellites and ground-based observatories, and numerical modeling. The meeting included a balanced diet of presentations, from multi-wavelength observational approaches to cutting edge techniques for theoretical modeling of the systems.